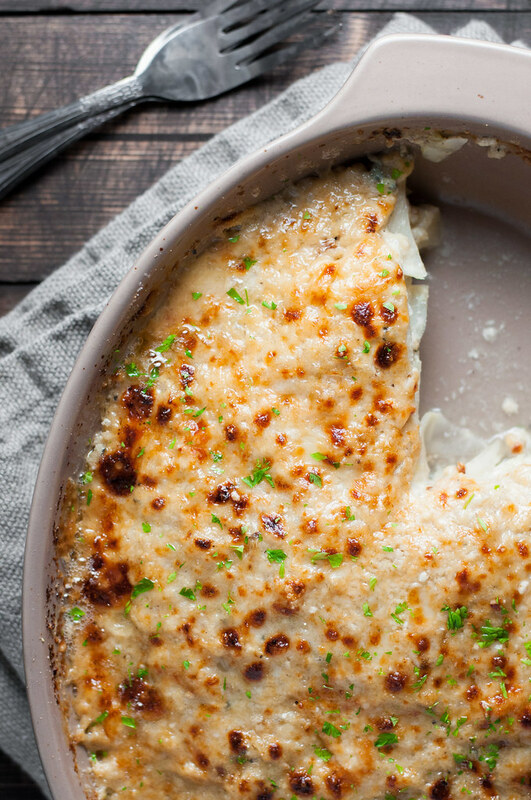 Before I made this gratin, I perused the web for other kohlrabi gratin recipes and ideas for making it less blah to eat. See, I made a mini version of the original blue cheese and kohlrabi gratin recipe from the cookbook a few weeks back, and it was lackluster. Probably the best way I’ve eaten kohlrabi to date, but it was a bit watery, and my feeling was that it needed a thick sauce to bind, flavor, and structure a mediocre (if we’re being honest) vegetable. I stumbled upon the Kitchen Princess blog and her kohlrabi gratin recipe, and this girl has some serious wit! Thank you, someone, for acknowledging that kohlrabi and apple salads are not, in fact, as fresh and lovely as the internet would have one believe. Anyway, props to Ally for her influence and attitude…I think Thug Kitchen may have stolen some material from her site. 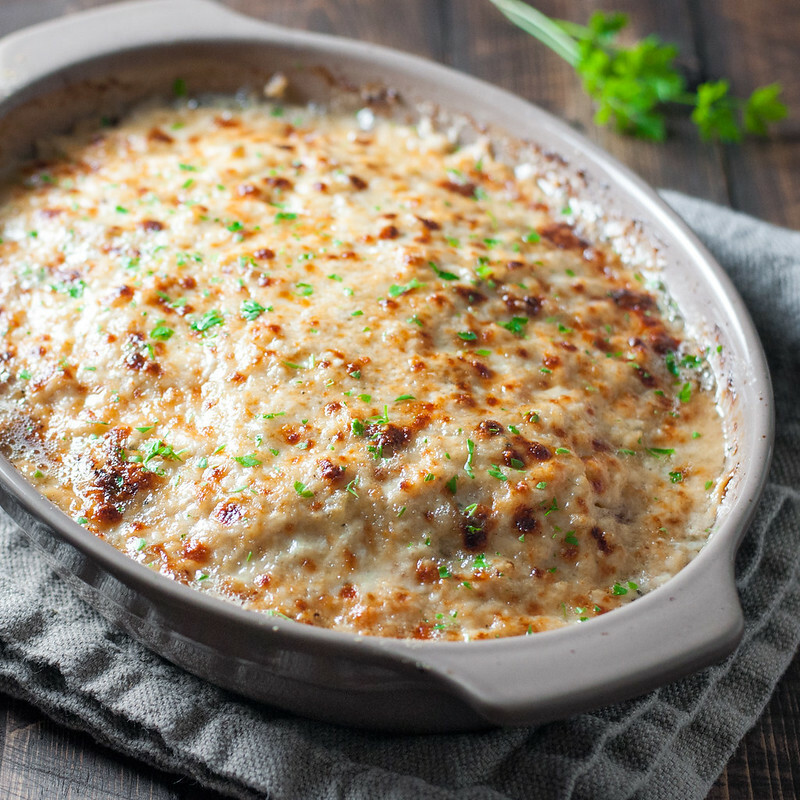 As I’ve come to appreciate throughout the gratin tour, fresh breadcrumbs are indispensable for entrée-worthy vegetable gratin dishes. Most of the time, the easy route is to toss the crumbs with olive oil and seasoning and sprinkle them on top for a golden, crunchy finish. That’s all well and good, but I couldn’t get the standout hearty vegan Spanish potatoes out of my head while rewriting my own version of kohlrabi gratin with blue cheese. 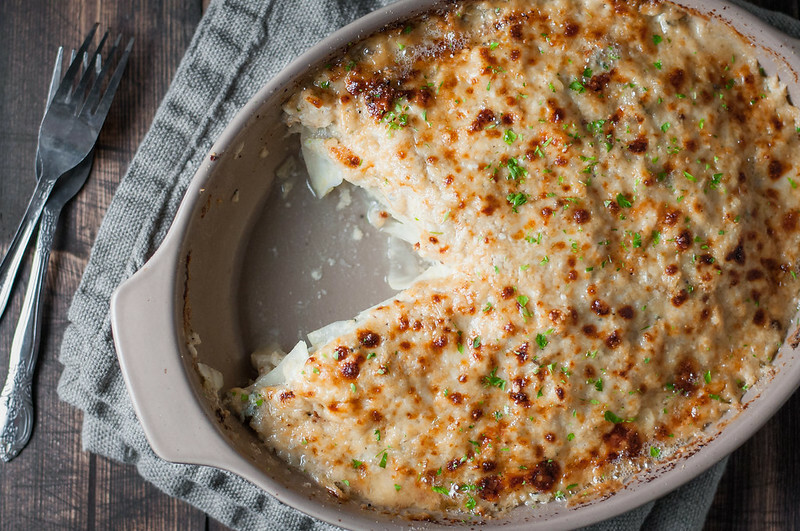 That prompted me to take a risk and throw some fresh breadcrumbs right on in to the simmered milk in this gratin recipe. My thinking was somewhere along the lines of holiday stuffing and a roux of sorts, in which bread replaces flour. The sauce did indeed thicken really nicely, basically into gravy. Without any means to follow through, I bet you $5.00 your first thought upon tasting it will be Thanksgiving stuffing. 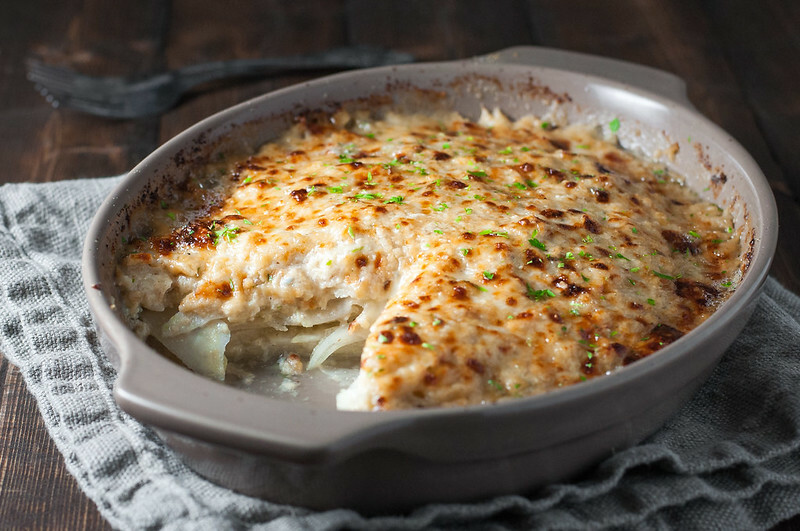 I never got enough kohlrabi in the first week of my CSA to make the full version of this gratin, and the pile I got at the grocery store for today’s kohlrabi gratin recipe weren’t exactly gorgeous. Perhaps they’re going out of season fast (or are not actually in season? ), at least where I live, but my kohlrabi slices never got über-soft during baking. They did tenderize somewhat, but there was definitely a crunch to some slices. Would I make it again? Hells yes. For best results, be sure to peel both the skin and the darker layer beneath it from the kohlrabi bulbs, slice your kohlrabi almost paper thin (a mandoline is essential), and don’t hesitate to bake the whole thing longer than prescribed if a paring knife stabbed into the center meets crunchy resistance. Test for tenderness at the point the foil should be removed. If you extend the bake time, keep the dish covered, which will steam the kohlrabi and help it soften quickly. Thank you guys for all the love on the breakfast sandwich post! It seemed you all liked the pics and were not scared off by my philosophy essay preceding the recipe. Sometimes when I sit down to write a post, more than just a recipe comes out. You’re always welcome to take one and leave the other, and I welcome comments on both the life topics and the food topics. Don’t be shy! I forgot to mention that I got some fun goodies in the mail last week from Blue Diamond/Almond Breeze. I don’t make my own almond milk with any regularity, and theirs is a brand I shop often, given its reasonable price and wide availability. So of course I jumped at the chance to partner with them to showcase a couple almond-centric recipes! I won’t reveal specifics yet, but let’s just say, you may want to check out part 1 in my Healthy Food for Travel Series. Just saying. Strong recommendation. Butter a 2 quart or similar sized baking or gratin dish with 1 teaspoon butter. Peel kohlrabi, removing both the skin and dark green layer below it, then slice into thin rounds on a mandoline and set aside. Melt 2 tablespoons butter in a medium skillet over medium high. Add onion and cook 3 to 5 minutes, until starting to brown. Add bread crumbs and cook a minute or 2, stirring infrequently, until some have browned lightly. Carefully add milk (it will steam), mustard, and bay leaf and stir. Bring to a boil, then reduce to a simmer for about 10 minutes, stirring frequently so bread doesn't stick to the pan. The mixture may look separated at first but will become a thick, uniform sauce as it cooks. Turn off heat and season with salt (about ¾ teaspoon) and pepper to taste. Layer kohlrabi in the prepared dish so slices overlap. Sprinkle each finished layer with salt and pepper. Every 2 layers, top kohlrabi with ¼ cup of the sauce and about a third of the blue cheese. My gratin had six layers of kohlrabi. After layering the last kohlrabi slices, mix remaining blue cheese with remaining sauce (there should be a good amount of sauce left). Spread gently over the top, then sprinkle with parmesan. Cover tightly with foil and bake 45 minutes. Increase oven to 375, remove foil, and bake another 10 to 15 minutes, until parmesan is melted and lightly browned. If the top hasn't browned, broil for a few minutes. Let cool 5 minutes before serving warm, topped with parsley if desired. Liberally adapted from The New Vegetarian Cooking for Everyone. 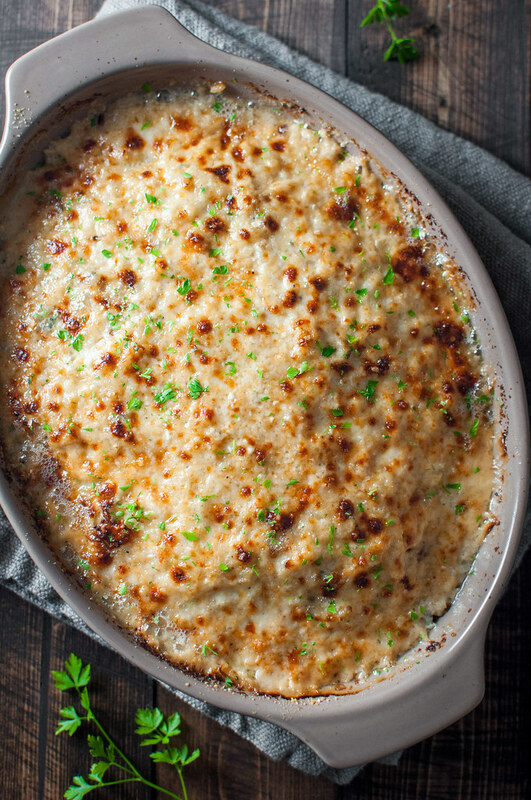 I use Trader Joe's gorgonzola in this recipe. It's firm and easy to crumble, and not overly pungent. Note: This page contains affiliate links. It does NOT contain sponsored content. 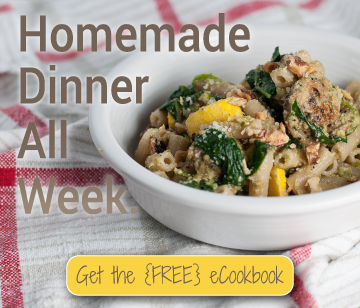 Affiliate links (to products I recommend, on Amazon) offset my ingredient and website maintenance costs, so I can keep bringing you semi-crunchy (jk) recipes like this one. Thanks! I tried quite a few casserole recipes with kohlrabi and it is really a difficult vegetable when cooked, sometimes really really good, sometimes I just want to throw everthing away. Another great way to eat it, is just a simple soup: a good stock where you cook the kohlrabi sticks until soft and some nice semolina dumplings. I think I like this even better than salad.